July 1, 2012 - In response to increased demand kit, manufacturer Zenith Aircraft Company has introduced a new Quick Build Kit (QBK) for its popular low-wing Zenith CH 650 cruiser light sport kit aircraft. With the Quick Build Kit, the main fuselage portion of the all-metal aircraft is first assembled at the factory, resulting in a dramatically reduced kit build time and overall simplified construction. Additionally, the kit factory now also offers factory-installed bubble canopy and cabin frame to further quicken the build time. The base price for the Zenith CH 650 Quick Build Kit (QBK) is $22,950., which is $4,450 more than the $18,500 cost of the CH 650 base kit. 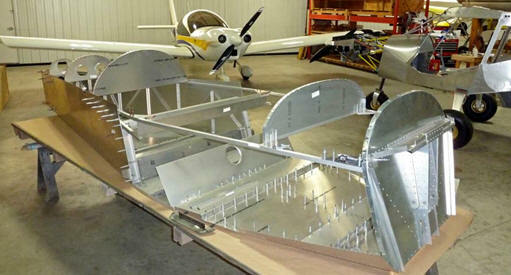 The standard kit makes extensive use of modern CNC fabrication technology, and includes many pilot-holes, factory-finished wing spars, and all hardware required to assemble the entire airframe. Zenith also sells component kits to builders who prefer to "buy-as-theybuild" or the aircraft can be scratch-built from the available drawings (blueprints). The Zenith CH 650 is a second generation light sport aircraft design developed specifically for Sport Pilots. It is the latest model in the Zodiac line of aircraft from aeronautical engineer Chris Heintz, first introduced in 1984. This newest model offers updated features including modern new styling with a larger cabin area and new bubble canopy. Standard features include wing baggage lockers, dual welded aluminum fuel tanks (located in the wings), choice of landing gear configuration (tricycle or tail dragger). Zenith Aircraft Company introduces Quick Build Kit for the Zenith CH 650 cruiser kit plane. Builders can choose from a wide choice of available engines and firewall-forward packages for the Zenith, including engines from UL Power, Rotax, Continental, Jabiru or Lycoming, as well as automotive conversions such as Corvair, Honda-based Viking, VW, and more. Zenith Aircraft Company has been manufacturing kit aircraft for the past twenty years from its modern production facilities in Mexico, Missouri (centrally located in the U.S.) and holds monthly hands-on builder workshops at the factory. 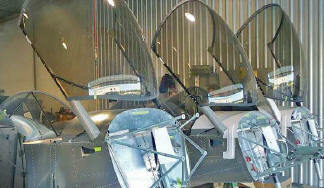 Demo flights in the aircraft are also available at the factory.